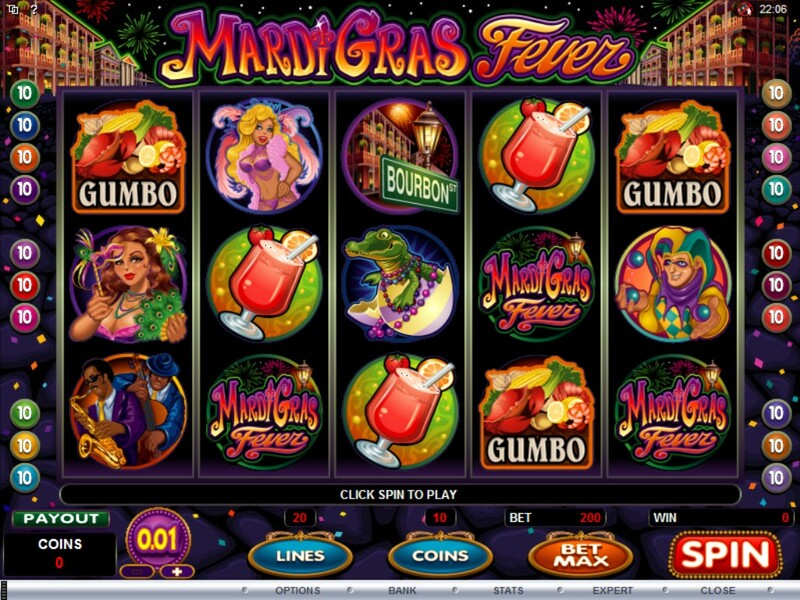 You can party and let your hair down if you decide to get stuck into playing the Mardi-Gras Fever slot game and boy what a party you will be having on this multi-line and multi-stake Microgaming designed slot. What Microgaming have chosen to do in regards to the actual design of this all singing and all dancing slot game is to make it a slot that every player can configure to suit their bankrolls, as the 20 pay lines are all optional and there are more than enough different coin value settings to suit every single players gambling budget! The bonus games are where all of this main action will be going on when you play it, and as such you will be hoping the bonus game awarding reel symbols do spin in and trigger one of the two different bonus games. Take a look at not only how those bonus games trigger but how they play off by reading the following section of this review and please do make sure you sample its delights as soon as you can do at any of our approved casino sites! A potential 12,000 coins can be awarded to you if you manage to spin in on any base game spin you play off on this slot game 3 or more of the Bourbon Street bonus reel symbols. When you do spin in that many reel symbols you have to pick off locations from the screen to find out just how much you have won. However, if you spun in 3, 4 or all 5 of the Joker reel symbols then you are going to be playing off what we feel is one of the most exciting free spin bonus games attached to any Microgaming designed slot game! That free spin bonus round is going to see you being awarded with just 5 free spins, which cannot be re-triggered, however what makes that bonus game a very exciting one to watch playing off is that all winning combinations that you spin in during it are going to be boosted in value by a huge x10 their pay table listed payouts amounts! The maximum free spins bonus game payout is an enormous 200,000 coins so it will be worth playing this slot game and then pinning your hopes on that bonus game being triggered! There is no getting away from the fact that the Mari-Gras slot is a very high variance slot, and that playing structure will dominate the free spins bonus round! However, do not expect to trigger it as often as you can trigger free spins bonus games on other slots. Also never think that when the bonus symbols finally do spin in and trigger that free spins bonus game that you are going to win big from it, for having played this slot many times in the past we can report the amounts paid out via the free spins feature can and will vary in size! However, as long as you do not lose sense of reality when playing this slot and sensibly stake each spin then you should get plenty of fun and certainly plenty of excitement out of playing it online. Just remember that the 200,000 coins you could win via its bonus games are fairly rare events, but as this slot like every other Microgaming slot is completely random with a high level of luck when you are playing it you could be the lucky player who does bag a small fortune!